Photo. Rapa Nui sculptors made moai. Moai are the enormous "Easter Island heads" that have come to symbolize the ancient traditions of Rapa Nui, the native culture of Easter Island. Now a part of Chile, Easter Island is the most isolated, western point of the Polynesian Triangle of the South Pacific. Rapa Nui civilization flourished on Easter Island between 1250 and 1500. Moai are called "Easter Island heads" for two reasons. First, the statues' heads are disproportionately large: the average head-to-body ratio is 3/5. Second, many moai are buried to their shoulders, making them appear as only heads. Most moai remain at the Rapa Nui quarry, Rano Raraku, shown in the photograph above. Tools and other implements unearthed at Rano Raraku have given archaeologists and anthropologists clues about how moai were carved. Most moai are made of tuff. Tuff is a soft volcanic rock native to Easter Island. 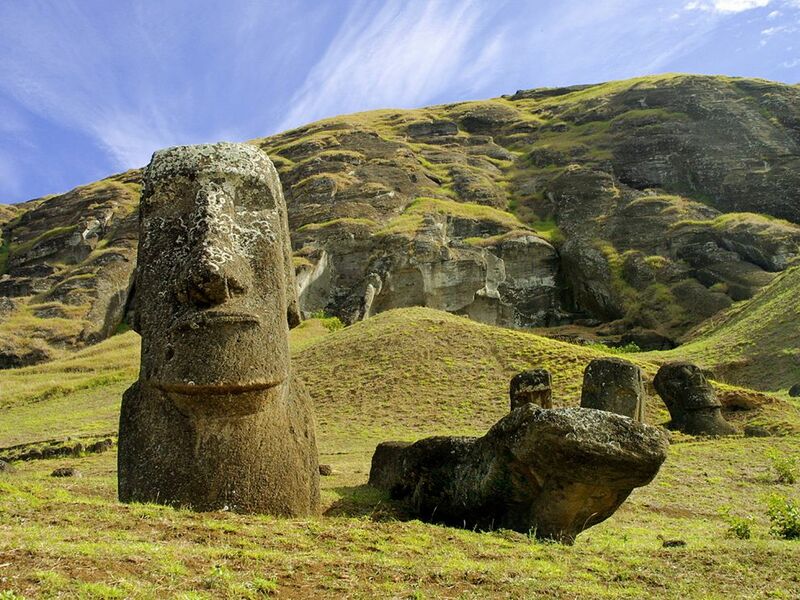 (A few moai were carved from basalt and scoria, other volcanic rocks.) Because tuff erodes easily, few of the moai's original designs remain. Moai that were buried retain some original markings, which are similar to Rapa Nui tattoos of the period. Moai are known for their exaggerated brow ridge and nose. However, most moai also had decorated eyes. Rapa Nui sculptors used white coral in the eye sockets, with black obsidian or red scoria for the pupils. All moai were toppled in the 18th century, following a Rapa Nui civil war or other internal conflict. Like the moai above, most moai were deliberately pushed face-down. The hundreds of moai standing on Easter Island today were restored by historians, anthropologists, and archaeologists in the 20th century. Rapa Nui are the people and culture native to Easter Island. Rapa Nui civilization is most famous for its giant stone statues, carved between 1250-1500. Rano Raraku is the main stone quarry on Easter Island. The main stone mined at Rano Raraku is tuff. Most moai originally had "tattoos" carved into their torsos. Their eyes were decorated with white coral and either black obsidian or red scoria. Why do you think most moai were pushed face-down during a conflict? • Moai represented tribal ancestors. Pushing them face-down was an insult to the surviving members of that tribe. • Moai represented Rapa Nui deities. By pushing their faces down, the gods did not have to witness the Rapa Nui conflict. • Moai simply fell into disrepair and toppled over. prominent bone above the eye. Also called the superciliary ridge and supraorbital ridge. hole in the skull where the eyeball and its associated tissues are secured. Also called the orbit and eye socket orbital cavity. very large stone figures carved and displayed on Easter Island. site where stone is mined. people and culture native to Easter Island. Also another name for Easter Island. permanent ink decoration on skin.